If you’re the type of person who has a drive for excellence, is always asking “Why?”, and hates being bored, then CFI Group might be the place for you. We are passionate about what we do. Our analysts provide insight that helps our business clients profitably grow, and our government clients better serve their citizen customers. 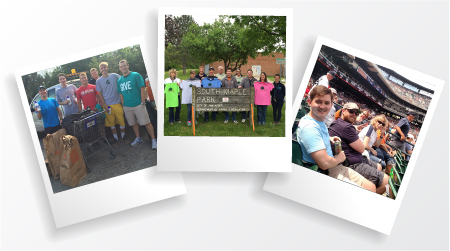 CFI Group offers a fun, fast-paced work environment, but we also understand that employees have lives outside of the office. We support this in a number of ways, including flexible hours, a casual dress code and excellent benefits. I invite you to explore CFI Group and the opportunities that await you. At CFI Group, we believe in working hard and life balance. But it doesn't stop there. We also believe that it's important to give back to the communities in which we work. Employees have opportunities throughout the year to participate in community service such as Adopt-a-Park or Food Gatherers. We also take time to get to know each other outside the office at company outings and holiday events. CFI Group employees helping out in the community and enjoying a Tigers game. CFI Group is a fun, fast-paced, growing, Ann Arbor-based professional services firm. We provide strategic customer and employee satisfaction solutions based on methodology of the nation’s leading measure of customer satisfaction, the American Customer Satisfaction Index (ACSI). We do not have any openings at this time, but if you think you may be a fit for our organization, feel free to send your resume with cover letter to HR@CFIGroup.com. If something opens up that we believe you are well-suited for, we may contact you. CFI Group is an Equal Opportunity Employer.